Learn 2 easy ways for How To Make French Toast — and discover the secrets and tips for the best French toast ever! French toast is a classic! But there is more than one way to prepare it, as you will see here. The type of bread, ingredients used for the custard, soaking time, and cooking method can all play a role in how the final dish turns out. There is only one problem: you are bound to get addicted to it! Just don’t blame me later, OK?! Ready? 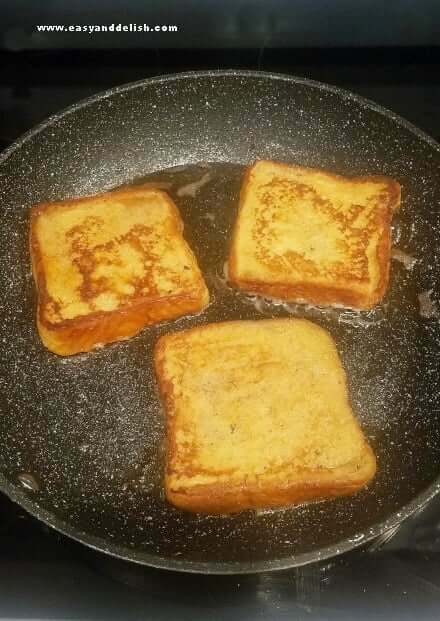 French toast is a 5th century dish made with bread soaked in an egg-custard liquid, then traditionally (pan or deep) fried, or baked (contemporary method). According to Wikipedia, among its alternative names are eggy bread, Bombay toast, German toast, gypsy toast, poor knights (of Windsor), and Torrija (Spain). In addition, it is known as pain perdu (lost bread) in France and as rabanada (plural, rabanadas) in both Brazil and Portugal. 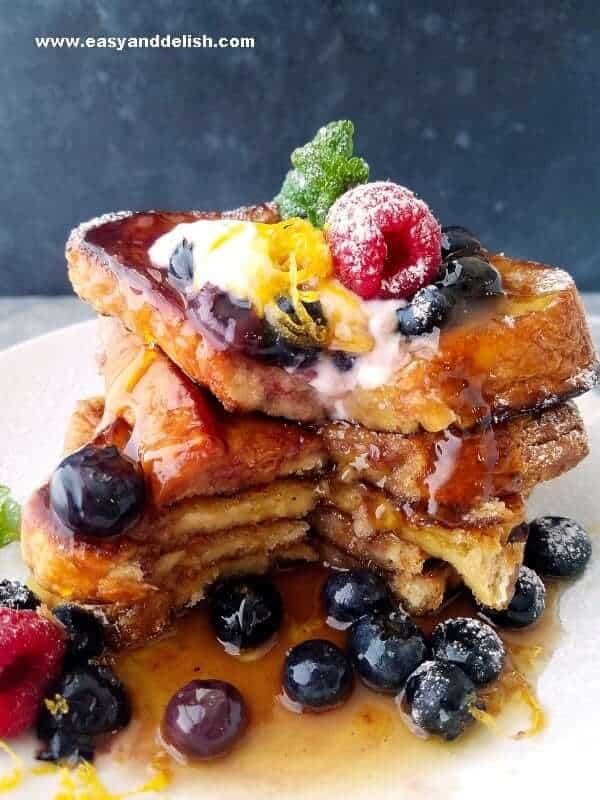 Bread, eggs, milk/heavy cream/half-and-half or wine, a sweetener (sugar or honey), flavorings (spices, vanilla, liqueur, etc), and butter or oil are the ingredients that are needed to make French toast. Some types of bread often used to make French toast are are French, Challah, and Texas toast, among others. The type of bread is not as important as its thickness (3/4 to 1-inch), and whether it is stale or fresh. Although some recipes call for fresh bread, stale bread does a much better job of absorbing the custard liquid, while still keeping its shape and firmness. Personal preferences aside, using fresh bread makes it mushy! Some may argue that leaving a thick slice of fresh bread to soak for only a few seconds will help prevent sogginess. But even if true, it will also make the French toast less tasty, because the flavoring is mostly in the custard liquid. You can test it out like I did, and attest to the results. As for my French toast, I will use stale bread always! Traditionally, either milk or wine (mostly European countries) has been the preferred liquid for French toast. But I found heavy cream or its creamy-yet-less-fatty alternative, half-and-half (i.e. half milk, half cream), to be more suitable. The reason why is because it makes the final dish more custardy — although the eggs that go along also help. 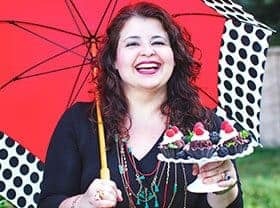 Moreover, a sweetener (sugar or honey) and flavorings (spices, vanilla, liqueur, orange or lemon rinds) are mixed in with the liquids, according to one’s personal preferences. For deep frying, oil for sure… but for the most common method, pan-frying, I will say both butter and oil. Why? Because butter adds flavor, while oil, with its higher smoke point, helps to prevent the exterior from ending up burnt. Avocado, sunflower, and grapeseed oil are some of the oils with the highest smoke points. There are a variety of toppings you can serve with French toast. Maple syrup/honey and butter, powdered sugar, fresh fruit, fruit compotes, or a mixture of cinnamon and sugar are among the many choices. Preferences vary from culture to culture or according to personal tastes. As for fillings, stuffed French toast is a contemporary creation. Nutella, flavored cream cheese, and peanut butter and jelly are among the many possibilities, as you can see from our Romeo & Juliet French Toast. The time of the day or occasion varies from one culture to the next. 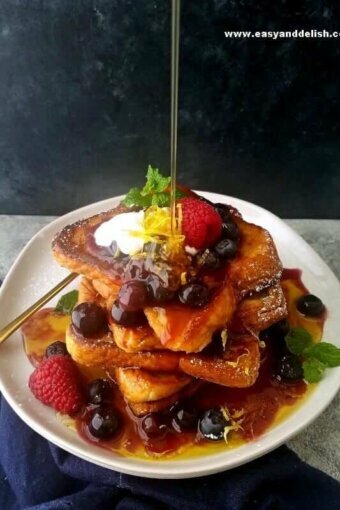 In America, French toast is usually served for breakfast, any time of the year, while in Brazil and France it is more of a dessert. In Brazil, it is a Christmas tradition inherited from the Portuguese settlers, while in Spain, it is commonly served for Lent or Holy Week. Standard or Overnight French Toast? Both methods show great results. If soaking the bread in the custard liquid overnight, baking is a more suitable cooking method. It makes the custard liquid absorbed during the soaking process evaporate and dry off more efficiently. As for standard French toast, the soaking time will depend on whether one is pan frying or deep frying. If deep-frying, let stale bread soak in the custard liquid for more time (about 20 minutes). If pan-frying, allow stale bread to soak for 20 seconds to up 2 minutes per side. Placing soaked toasts on a rack to drain off excess liquid will make toast firmer. If making a larger sized batch, the best way to keep French Toast warm is in a 200 F oven. 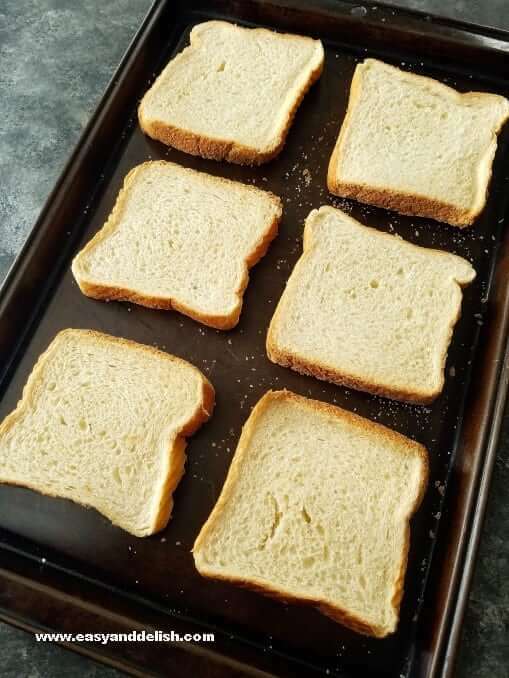 Place cooked toasts on a baking sheet in a single layer, and keep on the middle rack of a warm oven until the whole batch is ready. As noted earlier, traditional French toast is fried. There are 2 ways for frying: deep-frying or pan-frying. 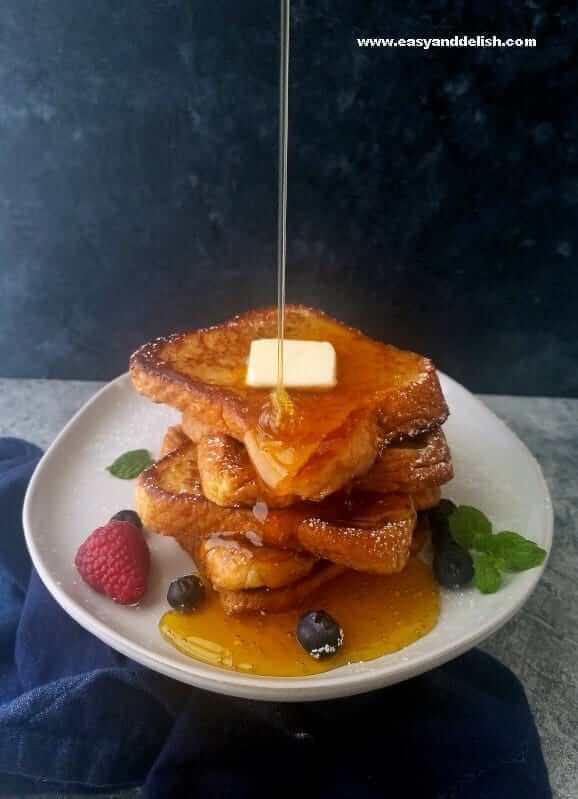 If deep frying (which is the method used for Brazilian French Toast or rabanadas), use French bread, which is a better size for deep-frying, and follow soaking time and cooking method specified in that recipe. This is my personal favorite because it is custardy on the inside and crunchy on the outside. If pan-frying, follow recipe below. In a medium mixing bowl, whisk the eggs until no whites are showing. 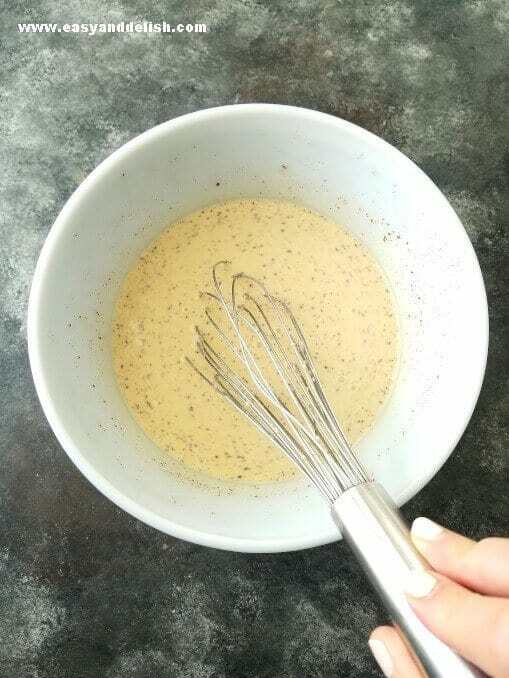 Then, whisk in heavy cream, milk, sugar, vanilla, and spices until homogeneous. Dip bread into mixture and soak for about 30-60 seconds on each side. Then, place slices on a rack set onto a sheet pan and let sit for about 2 minutes to drain off excess liquid.. Melt 1 tablespoon butter and 1 tablespoon oil in a large nonstick frying pan over medium heat. Cook in batches. Place slices of bread into the pan in a single layer and cook until golden brown (1-2 minutes per side). Remove from pan and place on a sheet pan in the preheated oven to keep them warm while cooking the remaining toasts. Repeat with all slices. 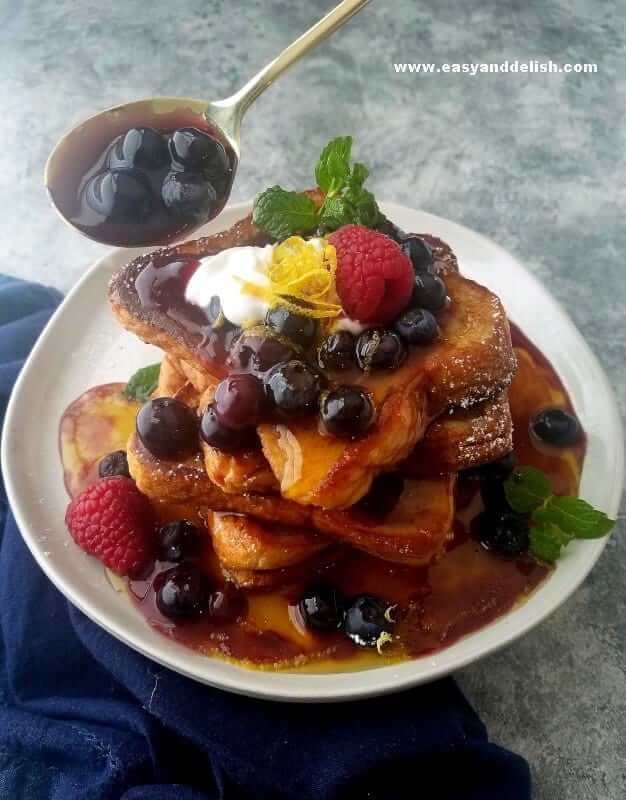 Serve French toast warm with maple syrup, berries, or any other topping of your choice. Learn two different ways How To Make French Toast -- and the secrets and tips for the best French toast ever! FRENCH TOAST 2 WAYS: If deep-frying, use French bread (better size for deep-frying) and follow soaking time and cooking method in this RECIPE. This is my favorite because it is custardy on the inside and crunchy on the outside. If pan-frying, follow method below. Dip bread into mixture and soak for about 30-60 seconds on each side. Then, place slices on a rack set onto a sheet pan and let sit for about 2 minutes to drain off excess liquid.. Melt 1 tablespoon butter and 1 tablespoon oil in a large nonstick frying pan over medium heat. Cook in batches. Place slices of bread into the pan in a single layer and cook until golden brown (1-2 minutes per side). Serve warm with maple syrup, berries, or any other topping of your choice. 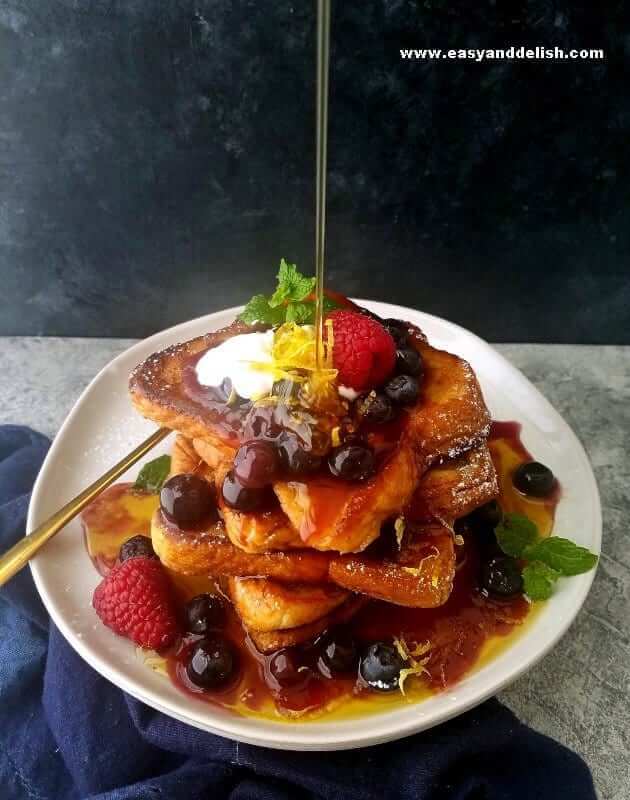 Love French Toast? Try our Romeo and Juliet Stuffed French Toast Casserole. So informative! Would love a slice or two smothered in maple syrup. Recently I enjoyed a French Toast casserole, where the slices of bread were piled 3 deep. More eggy custard was pored over the entire dish, it was just divine. Haven’t had French toast in so long…must make soon. Your first photo is amazing, it is perfect! Very interesting! I enjoyed all the historical and cultural info. I love French toast. Not long ago, I made some with a rustic wheat bread, and I really liked it. I realize that it’s not traditional, and may not be everyone’s cup of tea, but I felt the wheat balanced the sweetness of the syrup in a really nice way. Ty, Jeff! I bet it gave the toast a great balanced and was delicious too.